Pitched somewhere between Roman Polanski’s harrowing psychodrama Repulsion and more generic scare-fare in the vein of What Lies Beneath, Spanish horror Julia’s Eyes is an intriguing, occasionally effective yet unconvincing effort from director Guillem Morales which ultimately eschews a carefully crafted atmosphere in favour of a surfeit of cheap shocks and implausible plot activity. Julia’s Eyes starts strongly, and boasts a compelling premise. On a dark and stormy (what else?) night, Julia (Belen Rueda – giving an excellent, ballsy performance), who suffers from a degenerative eye condition, discovers her twin sister hanging in her basement. Despite the clear case of apparent suicide, and advice to the contrary, she believes that her sister – who had succumbed to blindness as a result of the same condition – has been murdered, and resolves to investigate matters herself. What follows is an initially atmospheric chiller that proceeds at a rapid clip, combining a number of old-school horror film tactics (red herrings galore, creepy strangers, gothic production design) with skilfully impressionistic lighting to reflect our heroine’s declining vision, and unsettling sound design (a squealing kettle here, pounding rain there). There’s even the requisite use of an out-of-context pop classic ; in this case the creepily ironic deployment of Dusty Springfield’s ‘The Look of Love’. A couple of sequences are particularly effective. In one, Julia, playing detective, finds herself eavesdropping on a revelatory conversation in the female changing rooms at the institute for the blind frequented by her sister prior to her death. Gradually, the blind women become aware of Julia’s presence, and slowly surround her. Although the blind community might object to their representation as creepy, giggling lunatics, there is more than a hint of the festering dread of Nic Roeg’s classic Don’t Look Now inherent in this sequence. Further down the line, there is a superbly edited and exquisitely tense denoument which makes jolting use of flash bulb photography, and plays cleverly on the themes of film’s themes of vision. Both in terms of plot development and visuals, director Morales is hell-bent on keeping the audience as firmly in the dark as Julia; this is a blessing and a curse, for while the blurred frame and lack of subjective clarity help us identify with our heroine, there seems to be no real narrative to follow, just a succession of shocks and all-too-brief set pieces, which comes as a disappointment after the promising first half. 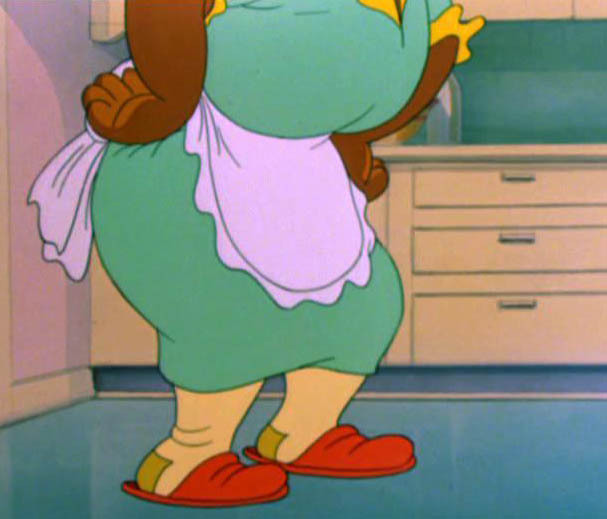 There is a lengthy, stylistically brave sequence in which the faces of all characters save Julia are obscured or kept just out of frame; it effectively makes us empathize with Julia’s worsening condition, but is also irritatingly reminiscent of Tom & Jerry’s permanently out-of-shot racist caricature Mammy Two Shoes. Furthermore, the distressed Julia is understandably in survival mode, but as a knock-on effect, there is little room for character development. She seems so hell-bent on getting herself into peril that it’s impossible not roll your eyes at her naivety. Perhaps there’s more to Julia’s Eyes than meets the, erm, major optical organ. As our heroine, ignorant of protective advice, continues to throw herself into dangerous situations, it could all be read as an extended metaphor for terrible relationships in which self-destructive women blind to such dangers end up with controlling boors or needy, pathetic losers. There’s also an unusual citation of Ralph Ellison’s classic 1952 novel of blighted African-American life ‘Invisible Man’, when a wheezing geriatric caretaker complains of his ‘invisibility’ within society, and warns that the mysterious killer too, is lost, unseen by the world. It’s a bit of a stretch, but still a quiet moment of thoughtful reflection in a film which, ultimately, has far too much going on. 1. My particular favourite examples of this trope are Roy Orbison’s ‘In Dreams’ in David Lynch’s Blue Velvet and Peggy Lee’s ‘Is That All There Is’ in Martin Scorsese’s After Hours. DVD Extras: The DVD features brief, but interesting interviews with director Guillem Morales, producer Guillermo Del Toro, and actors Belen Rueda and Lluis Homar, plus a B-Roll and the standard theatrical trailer. This entry was posted in Reviews and tagged blindness, dvd, film, Guillem Morales, Guillermo del Toro, Horror, Julia's Eyes, Justin Bieber, spanish on September 12, 2011 by Ashley Clark. Well, that was hardly the bad review I was expecting. You’re probably right that there is too much going in the second half, but I loved the atmosphere and Belen Rueda’s performance. Have you seen her in The Orphanage? Not quite about the comparison to Repulsion, but can definitely see the similarities with Don’t Look Now, having them watched them both within a few weeks during the summer. Have you managed to get ‘The Look of Love’ out of your head yet? It stayed with me for days. Have tried to be fair with it – there was good as well as bad, but I was disappointed with how it ended up. I haven’t seen The Orphanage, no. It’s on my list – have heard great things. I thought Rueda was very strong, which was essential given how far the film flew off the handle! Re: The Look of Love, I just listened to the ABC version. That did the trick. As you know I enjoyed this a little more than you. But I am easily pleased and a simple fool. Thanks for sharing this write up!! Great review. I enjoyed the movie too. Not so much the script. I saw traces of Hitchcock, Argento and Fleischer in it. http:/t.co/tyMsmZTv for my thoughts. Keep up the good work. Thank you. I’m a big fan of Dario Argento – Deep Red and Suspiria in particular. I’ll check out your blog.